Automotive Turbocharger Market size valued at USD 13 billion in 2017 and is estimated to exhibit over 9.5% CAGR from 2018 to 2024. 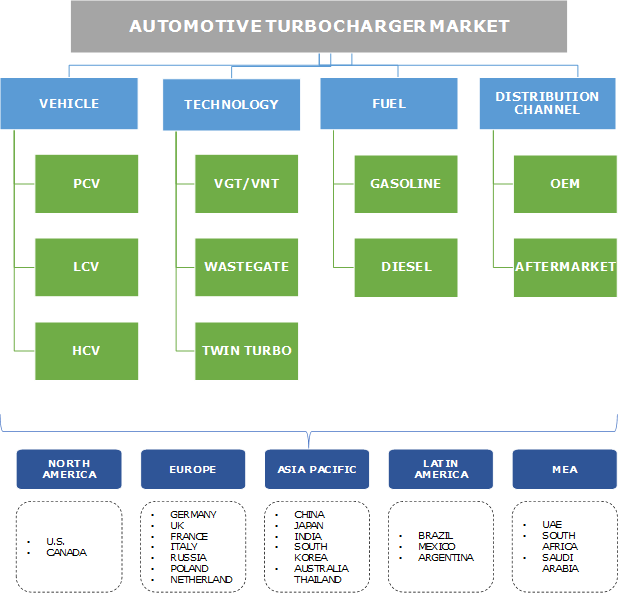 Stringent emission regulations applied by various countries coupled with fuel efficiency and engine downsizing requirements are the major factors accelerating automotive turbocharger market share. Transportation contributes to over 17% to CO2 emissions of which internal combustion engines contribute significantly. Recognizing the importance of controlling emissions from vehicles, government agencies are implementing performance-based emission standards, inadvertently will fuel the market size. Turbo system enhances the engine output power without change in piston displacement. This in turn will lead to engine downsizing and derive improved fuel efficiency and vehicle performance. 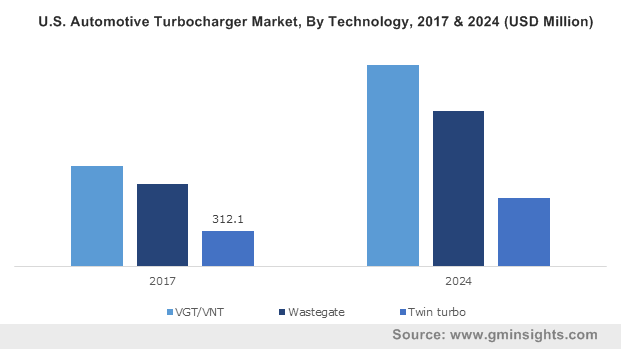 Reduction in vehicle weight by over 10%, 6% to 8% vehicle efficiency enhancement, and over 70 MMT reduction in carbon emission will provide strong growth prospects to the automotive turbocharger market share through the forecast period. Increasing penetration of electric vehicles coupled with incentives provided by number of government institutions for promoting the usage of zero-emission vehicles will hamper the ICE vehicle sales. For instance, Oregon, California, Connecticut, New York, Maine, Maryland, Rhode Island, Vermont, and Massachusetts are among the U.S. states that have signed MOU to deploy 3.3 million electric vehicles till 2025. Declining ICE automobiles will in turn restrict the market size through the forecast period. Increasing R&D and advent of advanced products such as electric powered forced induction system will significantly support the market growth. Fuel economy enhancement by forced induction technology in passenger cars and light duty vehicles are expected to witness strong demand. However, slow transient response typically at low engine speeds (turbo lag), is among the major turbo system drawback. Passenger cars in the market will witness highest growth through the forecast timeframe. Increasing consumer inclination towards highly fuel-efficient vehicles and performance output coupled with increasing spending power in emerging economies of India, Brazil, Indonesia, and Mexico will provide strong growth prospects. Heavy commercial vehicles contribute significant share of the overall vehicle emissions necessitating the utilization of turbo-systems. These vehicles require highly durable engines that can perform in any weather conditions. Industry players are focussing on developing new technologies that will support automotive turbocharger market growth. Moreover, strong emphasis of government bodies for reducing the vehicular emissions will provide solid growth platform through the forecast period. For instance, in November 2018, the Diesel Technology Forum introduced Cleaner Trucks Initiative (CTI) to address Nitrogen oxide emissions from heavy duty vehicles. This will necessitate the advancements in engine controls and design, air management and turbocharging, and advanced emissions control systems integration. VGT/VNT will contribute to the largest market share over the forecast timeframe. It improves engine output from forcing more air through compressor and injecting fuel into combustion chamber. VGT is designed for maintaining effective aspect ratio of turbo. This ratio changes from high speed to low speed engines owing to distinct wide commercial vehicle requirements. Wastegate turbo-segment will show significant gains over the forecast timeframe. Advancements in exhaust bypass valves allowing to bypass turbines coupled with the ability to control turbo-spin speed, and advance aerodynamics will improve the power density. For instance, in July 2017 BorgWarner introduced compact wastegate turbo for applications in Honda 1.0 litre engines. This turbocharger is integrated into gasoline engine and will be initially available for its Civic model in China and Europe. Gasoline automotive turbocharger market segment will witness significant growth owing to higher RPM advantages in passenger vehicles. Turbo system in these engines are designed to operate at higher RPM and requires smaller combustion chambers. High performance output in conjunction with the engine downsizing achieved through gasoline engines will fuel the overall industry growth. Diesel engines are anticipated to continue their dominance through the forecast timeframe. The system enhances transient performance, low-speed torque, and increased usage of turbo system to downsize diesel engines will catapult the market share. OEM segment is anticipated to hold largest share over the forecast timeframe owing to significant number of factory-installed systems. OEMs including Bosch Mahle Turbo Systems, Honeywell, IHI, Magnum Performance Turbos, Precision Turbo & Engines, TEL, and Turbo Engineering are among top OEM companies providing turbo systems to major automobile manufacturers. Aftermarket distribution channel primarily caters to replacement for damaged or failed engine components. High dependence of transportation industry on aftermarket services owing to unprecedented failure of engine components will provide considerable growth prospects through the forecast timeframe. Automotive e-commerce industry participants are emphasizing on DIY kits and economically competitive options to attract consumers. Europe automotive turbocharger market is expected to hold largest share during the forecast timeframe. Increasing usage of passenger vehicles coupled with engine downsizing and enhancement of engine performance are major factor contributing to industry growth. Additionally, government regulations to reduce CO2 and nitrous oxide emissions through automobile exhaust will further boost the product adoption. The U.S. will show steady growth over forecast timeframe owing to regulatory bodies such as the U.S. Environmental Protection Agency (EPA) formulated stringent fuel economy and emission standards. It enforces automobile manufacturing companies to develop engines that are cleaner and more fuel efficient. Additionally, CAFÉ has mandated improvement in the fuel economy of vehicles by 40%. These factors are anticipated to fuel market growth. Some of the key manufacturers in the market share include Banks Power, BorgWarner, BMTS Technology, Honeywell International Inc., IHI Corporation, Linamar Corporation, Mitsubishi Heavy Industries, and Rotomaster. Industry participants are engaged in merger and acquisition strategies to expand their product portfolio and geographical presence. For instance, in September 2017, BorgWarner completed acquisition of Sevcon, Inc. This strategy enabled the company to offer electrified propulsion solutions for customer base across the globe. Automotive turbocharger market share is highly competitive owing to the presence of key players. Industry participants offer their turbo system products through their robust distribution channel for improving their industry foothold and meet the growing consumer requirements. Competitive pricing, quality product and hassle-free operation are among the major detrimental factors affecting brand success. Major cost optimization strategies adopted by industry participants include continuous optimization and product portfolio upgradation. Maintaining a high level of product safety and quality is an essential factor as the component manufacturers are liable to claims and products recalls during failure of product in warranty period. The industry has witnessed large number of product recalls and backlogs over the past years. This risk of recalls increases when automobile manufacturers offer longer warranty periods to attract customers.